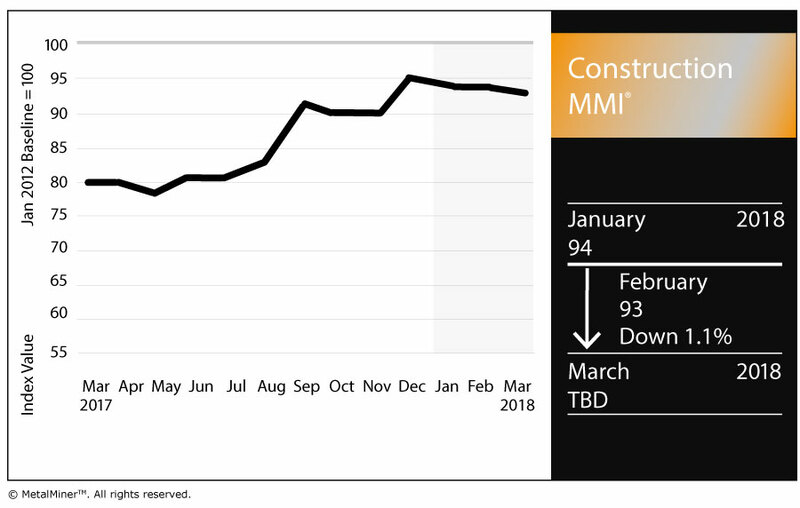 The Construction MMI (Monthly Metals Index) dropped one point this month, falling to 93 for our March reading. Within the basket of metals for the Construction MMI, Chinese rebar and H-beam steel prices dropped on the month. Meanwhile, U.S. shredded scrap steel rose 8.4% on the month, while European commercial 1050 sheet fell 3.0%. Chinese aluminum bar also fell, dropping 1.0% month over month. According to U.S. Census Bureau data for January, total spending stood pat from December, but was up year over year. Construction spending during January 2018 was estimated at a seasonally adjusted annual rate of $1,262.8 billion, up minimally from the revised December estimate of $1,262.7 billion, according to the Census Bureau. The January figure, however, was up 3.2% from January 2017’s $1,223.5 billion. Meanwhile, spending on private construction was at a seasonally adjusted annual rate of $962.7 billion, 0.5% above the revised December estimate of $967.9 billion. Under the umbrella of private construction, residential construction was at a seasonally adjusted annual rate of $523.2 billion in January, 0.3% above the revised December estimate of $521.8 billion. 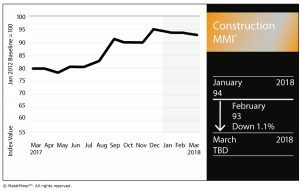 Nonresidential construction was at a seasonally adjusted annual rate of $439.6 billion in January, 1.5% below the revised December estimate of $446.2 billion. As for public construction, the estimated seasonally adjusted annual rate of public construction spending was $300.1 billion, 1.8% above the revised December estimate of $294.8 billion. Within that, educational construction was at a seasonally adjusted annual rate of $76.7 billion, 2.1% above the revised December estimate of $75.2 billion. Highway construction was at a seasonally adjusted annual rate of $92.6 billion, 4.4% above the revised December estimate of $88.8 billion. Just like other metal-using sectors, the construction industry would also be impacted by President Trump’s announced steel and aluminum tariffs (especially steel). Trump’s announcement came just over a month after Trump proposed $1.4 trillion in infrastructure investment over 10 years. For a construction industry that saw spending flatten in January, a rise in materials costs would not be great news, should the tariffs become the law of the land. According to Philip Gibbs, an analyst at KeyBanc Capital, the tariffs might give steel stocks a short-term “sugar high,” he told Reuters, but that unsustainable pricing could eat into demand from manufacturers. The National Association of Homebuilders (NAHB) came out against the tariffs proposal, with the association’s chairman saying the tariffs would hurt consumers and make housing less affordable. “It is unfortunate that President Trump has decided to impose tariffs of 25 percent on steel imports and 10 percent on aluminum imports,” said Randy Noel, chairman of the NAHB. “These tariffs will translate into higher costs for consumers and U.S. businesses that use these products, including home builders. Of course, the metals world is still in wait-and-see mode regarding the tariffs, which have yet to become actual law.